Find and compare the best prices from a range of well known car rental companies at Katowice Airport. This is a free to use facility, enabeling you to book direct with the company quoting the price. 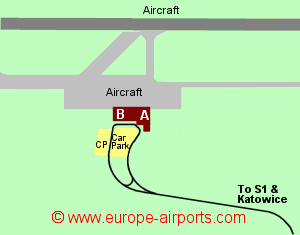 Katowice airport has three adjoining terminals, Terminal A and Terminal B(new in 2007), and C (new 2015), the first two being for departures and the latter for arrivals. An airport bus makes the connection between the airport and Katowice approximately every hour during the day and every 2 hours at night. There is a train station in Katowice. A taxi from the airport to Katowice centre is likely to cost 175PLN or 35 Pounds. Terminal A facilities include has 4 bars/restaurants, 2 banks, money change facilite, 5 shops and a business lounge. Terminal B facilities include 5 bars/restaurants, 5 shops, a business loung, and a conference room. Passenger throughput totalled 3.8 million in 2017, a 21% increase from the previous year.